Brewer and pub owner Greene King has bought seafood chain Loch Fyne for £68.1m, and says it sees the potential to double the size of the chain. The restaurant chain, which started in Scotland, has 36 branches mainly in southern England and is expected to earn about £8m in the coming 12 months. Greene King and other pub firms are looking to expand in order to offset the effects of England's smoking ban. The worry is that consumers will turn away from pubs now they cannot smoke. Other firms have been moving into the restaurant business including Laurel Pub Company's £123m purchase of tapas chain La Tasca and Ultimate Leisure's £28m acquisition of restaurant business The Living Room. "Loch Fyne is a high quality, well-respected British brand which gives us greater access to the premium end of the market," said Rooney Anand, Greene King's chief executive. 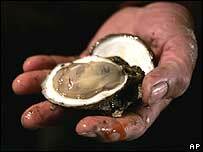 Loch Fyne was started in 1977 as an oyster bar on the banks of the loch in Cairndow, Argyll and Bute.